The propensity of the stern to walk to starboard is minimal. Fifteen degrees of offset maximum until she is going straight. 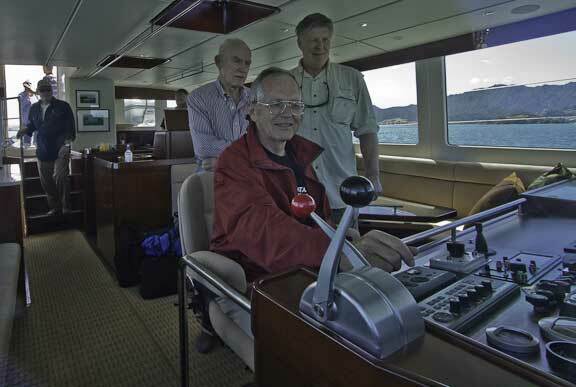 Turn in reverse can be accomplished to starboard with moderate adjustments to port possible using full port rudder. Turning going forward is excellent as reported. Rather than finessing this with the engine, strong bursts of power and full rudder deflection is best. Rotating counterclockwise using forward and astern can be done in limited space. Reverse is used to hold the boat while turning is almost 100% done with forward thrust. Backing through a narrow channel, say 75 feet (23m) is feasible with the stern pointed upwind. This is not recommended with the stern downwind. In 15 knots of breeze a turn against the wind can be done in two boat lengths. The stern spring line, rigged from the aft of the central bollards, works well for bringing the boat alongside. If the stern needs to be brought closer to the dock use port rudder. If the bow is blowing off, starboard rudder brings it back. The stanchion forward of the stern spring works well for the breast line. In a beam wind blowing off the dock it is best to use the stern spring. A bow spring line is not as effective as the stern spring. Works best between stanchions forward of the forward bollards. For rotating off the dock to change direction or with wind blowing on the dock, use double ended line through anchor fairlead, with rudder at full deflection. 180 degree rotation is easy. Breeze blowing from bow quarter, use bow spring, hold position in reverse, stern line second. Breeze blowing from stern quarter, stern spring bow second. Straight approach OK with both of above. Wind on beam, use stern spring if possible. Approach dock at 30 degree bow angle and turn to bring midships alongside. Straight in approach results in too much drift to leeward. Controlling the boat with a single screw without the thruster is easy, even in a beam wind off the dock, as long as you can get a line ashore. In this regard no different than the twin screw FPB 83. With a crew of two, wind off the dock, and nobody to help on the dock, it is better to put someone ashore. In many cases this is easiest by bringing the stern against the dock. After a period of experimentation in the marina we proceeded on the now familiar course towards Whangarei Heads. The breeze was blowing 15 to 18 from the southwest, and there was a bit more chop than before, maybe even some three footers (but mostly smaller). 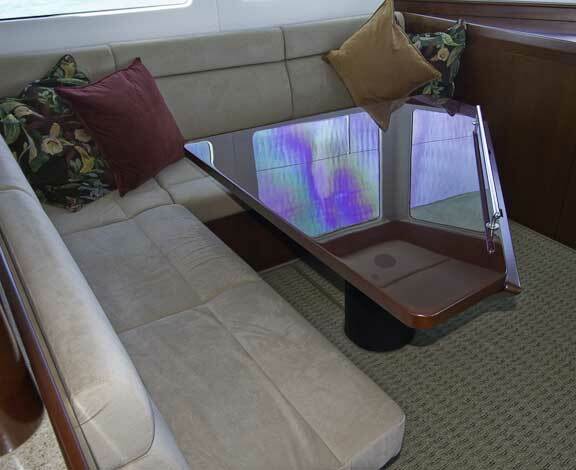 The slamming zone on this hull is centered about where the Owners of the first two boats are chatting. In these conditions you could easily enjoy reading a book here if you wanted to be on your own. We are feeling very good about the upwind motion as this is with the boat light. She will do even better when loaded. 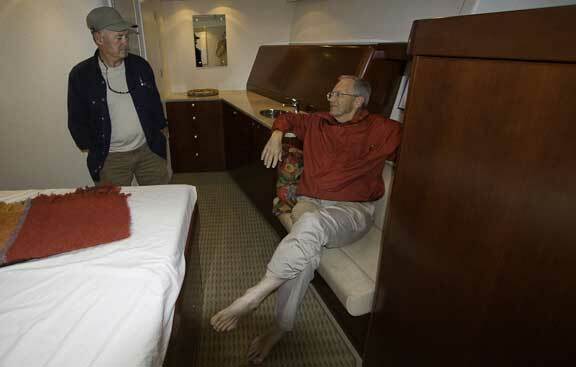 Our second Owner, and another ex-sailor, is testing the area outboard of the bunk as a sea-berth. 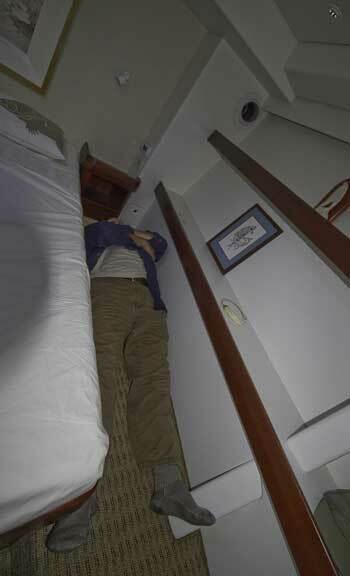 With his head aft (your motion sensing system is in the ears) this is looking like an interesting position if you don’t want to sleep aft in bouncy weather. The design of the seated helm position are working out as hoped. 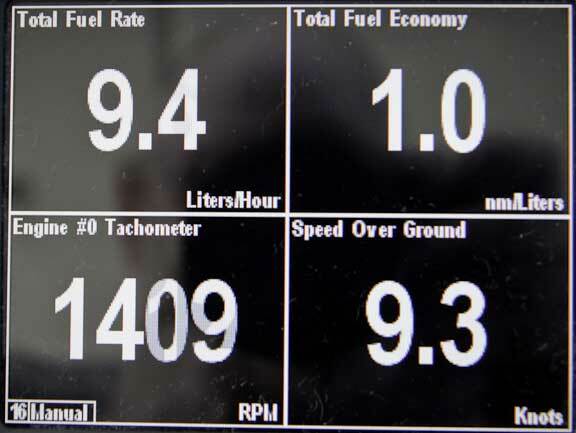 Data on the panels is legible, and major controls are within reach without standing. We are having some gremlins with the NAIAD hydraulic system, so we are using it sparingly. We have been pleasantly surprised at the soft motion and lack of roll with the stabilizers off. You could easily do an up or downwind passage without it, and beam seas – at least those so far – do not excite the hull very much. The center of pitch is in line with the middle of the fridge box as expected. Finally a bit more performance data, with the same caveats as the last. This and the following screen are when running with the breeze astern. If the booms were out it would be better. The engine is at the minimum continuous RPM (1200). 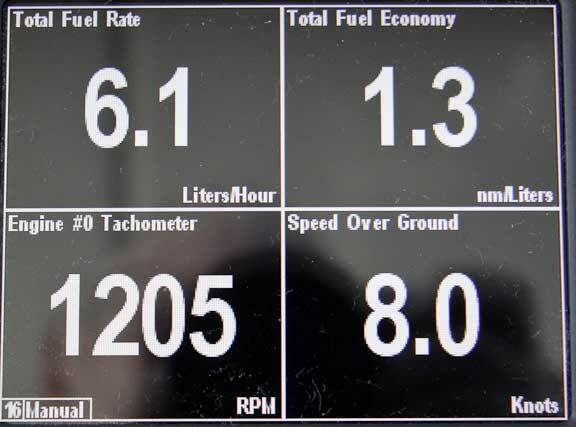 Fuel burn, as you can see, is minimal, under two US gallons per hour. This entry was posted on Saturday, March 27th, 2010 at 6:13 pm and is filed under FPB 64 Sea Trials. Both comments and pings are currently closed. You comment that you had a soft motion and lack of roll with the stabilisers off. I assume the foils are giving lift so the stabiliser fins are actually helping keep Avatar from rolling. Is there a minimum speed at which they start to help this way? When fixed in position the stabilizer fins will attenuate the roll period as long as the boat is not turning. If you are turning, then there is an angle of attack on the foils which may or may not be in the correct direction. If y ou were put off by the complexity and expense of the hydraulic stabilizers, this design would be a good candidate for stabilizer fish on the booms, fish boat style.